As we’ve previously discussed, 3D printers have become easier to use than the modeling software that’s required to create objects for the printers to print. Some have noticed this gap and have released more intuitive modeling software, such as Tinkercad (which is going away) and Autodesk’s 123D. Rick Companje had the same motivation when he created Doodle3D. Doodle3D is a tool that converts simple drawings into 3D printable files, much like the Crayon Creatures service, except that they’re printed on your personal 3D printer instead of shipped to you. The tool is a combination of software and hardware. 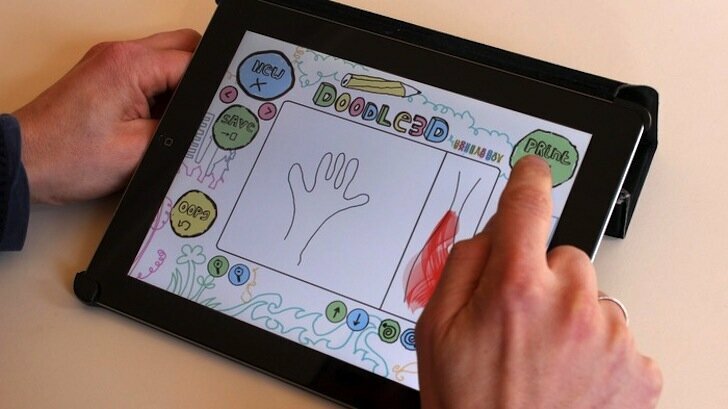 Drawings are done in the app on a computer or tablet, and then the files are sent wirelessly to a wifi dongle that’s attached to the USB port of a printer. In the app, 2D drawings can be extruded to 3D drawings and then twisted and modified. There are many limits with this style of modeling, but it’s still pretty powerful. This method of modeling is ideal for making drawings more dynamic, making stencils, Christmas ornaments, cookie cutters, containers and vases, and even things like bottle openers and tweezers. If you’ve got an ink pad you could even print your own fonts and signatures. With funding, I’m sure the drawing app will become more robust too. Though, Doodle3D was already featured at the 3DEA popup in New York. The challenges for the Doodle3D team are getting the wifi box to be compatible with as many printers as possible, because right now it only works with open source printers that have a serial USB port. I feel like full compatibility could be achieved by offering a form of the software that just outputs .stl files. Regardless, it’s pretty neat, and it will help younger minds get into 3D printing before they learn how to work more complex modeling software. You can reserve a wifi box for $99 and help them get their funding, which should happen fairly quickly. When I started writing this, funding was around $11,000, and now it’s about $15,000 (of a $50,000 goal). I think we’ll see this on the market soon.